When I was in Paris I saw the Eiffel Tower from many points around the city. I started to watch for all the different places I could catch glimpses of this monument from parks and streets and at different times of the day. Here are some of my impressions. Look up and you can see it! I saw this early in the morning. This entry was posted in France, Paris, Travel and tagged Eiffel Tower, Jardin des Tuileries, monument. Bookmark the permalink. That’s a fabulous photo of the Eiffel Tower. Thanks – I thought it looked quite impressive that morning! That last one is very striking with those cloud formations behind it. I thought that the clouds made a dramatic background too! Somebody was sure to do La Tour Eiffel, Meg, so it might as well be you. :) I like the way it’s leaning on those cream buildings (a leaning tower!) and that last shot is wonderful. Thank you Jo – I wanted to show the Eiffel Tower in a slightly different way and I remembered all these pictures from around Paris. It was fun reminiscing! Just lovely. Don’t you love love love Paris? Thank you Jennifer and yes, Paris is absolutely one of my favorite places! Fabulous photos of the Eiffel Tower. I have yet to see it. Your pictures made me feel like I was there. Thanks. Thank you Darlene! I hope that you get to see Paris and the Eiffel Tower – they are both marvelous! It the first time I see the Eiffel tower from this angles…lovely! It was fascinating to be able to see it from so many places! We noticed that in Paris, too. It seemed like every picture had the Eiffel Tower somewhere in the background. More recently, we’ve visited Tybee Island and searched for the lighthouse wherever we wandered. It wasn’t quite as visible as the Eiffel Tower, though. I agree – after a while I really starting to look for it wherever I went in Paris! What a cool idea, and the series of photos turned out beautifully! Perfect for the challenge. I hope that you have a wonderful trip and take lots of pictures. :) It’s so interesting to see the Eiffel Tower from lots of different places! I should do the same next time am back there. It’s a lot of fun and I’m really happy to have so many souvenir pictures of the Eiffel Tower! What a great idea… and so different than the usual shots of the tower. Thank you – I wanted to show there are other ways of looking at the Eiffel Tower! It looks like it followed you everywhere! That is a great last shot, love the lighting. Thank you Patti – seeing the Eiffel Tower is one of my favorite memories of Paris! Probably the most famous “monument” of them all. I especially like your last photo. Thanks Karen – I thought that because it was early the whole scene looked a little less like a typical postcard! I like the idea of seeing it from different places. Really neat interpretation. Love the garden photo and the last photo. What a beautiful idea. Kind of like life – same tower – many different points of view! The last photo is very special, Meg. I think this was a very clever way to document your visit. I don’t think I’ve ever seen anyone else take the care to find the Eiffel Tower quite like you did–almost like finding the hidden image in the photo. Loved it! Thank you so much Debra. I’ll never forget the times that I would look around and see the Eiffel Tower unexpectedly. It was a wonderful experience! Wow, how great idea You got. Very beautiful photos. I love it indeed. In next May we’ll spend one week in Paris celebrating my 70 th anniversary. Thanks and I hope that you have a wonderful anniversary celebration in Paris! Love all the different view points. Thanks – it was really interesting to simply look up and see the Eiffel Tower from so many places! Great idea! 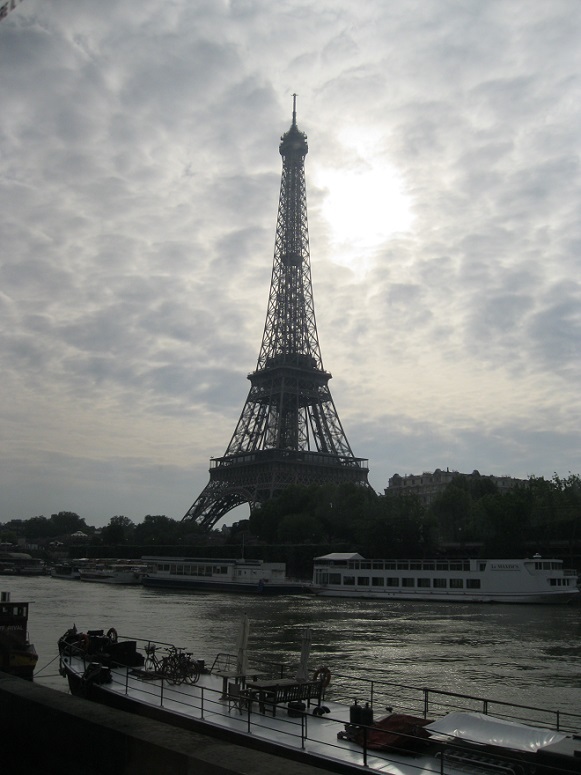 Paris just wouldn’t be the same without the Eiffel….